Chimelong Ocean Kingdom grand-opened in March 2014 on Hengqin Island in Zhuhai, China. The 125-acre park features seven unique areas, each themed around a different part of the world’s waterways. It is the most recent venture of Guangdong Chimelong Group Co. Ltd, founded in 1989, and the operator of numerous world-class tourist complexes, including theme parks and hospitality developments. Chimelong’s stated goal is to become the top tourist organization in the world. The company is headed by Mr. Su Zhigang, Chairman. The park was awarded five Guinness World Records: World’s Largest Aquarium, World’s Largest Aquarium Tank, World’s Largest UnderwaterViewing Dome, World’s Largest Aquarium Window and World’s Largest Acrylic Panel. The park is also in line for accolades within the attractions industry: There, Chimelong Ocean Kingdom is widely regarded as a gamechanger, in terms of product quality, originality and as a proving ground for east-west collaboration. InPark spoke to three companies about how they view the project and its effect on their way of doing business. Renaissance Entertainment provided concept design and art direction to Guangdong Chimelong Group, in creating four attractions for Chimelong Ocean Kingdom. The Producers Group was subcontracted by Renaissance for technical design, project management and special effects: on three marine mammal shows – Tropical Heat (spotlighting dolphins), Sea Lions vs Pirates, and Under the Polar Moon (spotlighting beluga whales) – and for The Chimelong Ocean Kingdom Finale Celebration (Lagoon) Show, a multimedia spectacular with a simulated volcano, fireballs, stunts, water and theatrical lighting. FUNA’s scope of work on Chimelong Ocean Kingdom encompassed the audio design and much of the integration of the park-wide audio including the open areas, animal exhibits, restaurants, gift shops, and most of the attractions, initial AV design of many of the major venues, the design and integration of the parade control and audio, and the design and integration of the lagoon show audio system. What is the significance of Chimelong Ocean Kingdom in the big picture of Asian theme park growth? As a ‘for us, by us’ kind of park, Chimelong is unique to any market I have seen. It’s in China, for China. They wanted some Western influence and the park is bilingual because of its proximity to Macau and Hong Kong, but the customer base is almost exclusively Chinese and the experience is very Chinese. Some current estimates proclaim China has as many as 300 parks in the development pipeline; the last number I heard that sounded more realistic was 52. Even 52 may sound like a lot – but China’s population is 6.5 times larger than that of the US, and the US has 6 Disney parks and 3 Universal Studios parks. When you consider that along with the continued growth of the middle class in China, the capacity to build and support much, much more – for many years to come – is a reality. Other Western brands are also manifesting in this market: Dreamworks, Fox, Paramount… The parks and resorts that emerge from that will put an upward pressure on quality for all operators and developers. It isn’t going to eradicate ‘faster and cheaper’ [see below] but it will ripple through the region and through the industry. The full effects may still be decades away, but they will occur in Asia faster than happened in North America. Ocean Kingdom reveals the progression of Mr. Su’s vision for Chimelong. The location – a major Chinese tourism hub – provides incentive to do something special. Stepping up your game to a higher quality park doesn’t mean you’re becoming Western: It’s a Chinese park, built by the Chinese people. Going through Ocean Kingdom, there are things that feel familiar, but it’s because they’ve applied the principles of good theme park development. It flows the way a park should flow. It’s laid out the way a park should be laid out. There is a certain amount of RMB per square meter for a park of a certain quality, and Ocean Kingdom reflects that. We see Chimelong as being one of the leaders of a revolution in theme parks. Chimelong Ocean Kingdom builds on their already well-established and well-attended parks in Guangzhou. They have a head start – not just in terms of properties and operations, but in terms of mindset. They have consciously chosen – through the leadership of Mr. Su – to create original attractions and features. They have taken the time to look around them and create their own unique brand. That’s why we like working for them. They are not going to shy away from creativity. They are not interested in duplicating entertainment from other parts of the world. In fact, Chimelong will be creating things others will want to try and duplicate. The Zhuhai location was obviously a very strategic choice. There is the elevated bridge being built to connect Hong Kong, Zhuhai and Macau, the ongoing expansion of existing transportation options such as roads, trains and ferries, and a high capacity border crossing near Ocean Kingdom that was obviously built for future traffic. The entire area is growing. Macau is rapidly running out of space. The University of Macau relocated to brand new campus built in Zhuhai. Students from Macau commute via an underwater tunnel across a waterway between Macau and Mainland China. It is amazing to see all the development that has happened in and around Zhuhai. This has all been in tandem with the development of the park and will certainly continue for the foreseeable future. How has the Asian market shaped the way your company does business? The need to do things faster and cheaper for the Asian market, which is now the primary market, has changed things forever for our company and for the themed entertainment industry. We’ve seen Western companies spend hundreds of thousands chasing business in Asia and then go away. You either learn tolerance for a process you may or may not agree with, or you don’t. Due to our involvement on two high-profile projects designed by Jeremy Railton: Crane Dance at Resorts World Sentosa, and several attractions at the Galaxy Macau, we became the guys who figured out how to do successful, large-scale projects in Asia. That is the bedrock of our company. We invested significant time and money to develop business in China: hundreds of bids, trips, and marketing initiatives. Our experience there has borne fruit and it has also changed how we process projects in Asia. Now we are established with real Chinese contacts, projects, and local resources. It’s not competitive to ship all our resources over from the West. Having learned how to compete on pricing, and how to vet local resources, we can produce product for that part of the world that we’re proud to put our name on. The only way to do it is to get on a plane, go to meetings, visit factories, visit people – to establish and maintain a physical presence in the region. That’s how you get to build in China, for the Chinese, with Chinese resources, and locally review the process to ensure quality the same as if you were building in Hollywood. Several years ago FUNA defined China as an expansion priority. The result to date has been an office in Shanghai, local staff, and local fabrication. 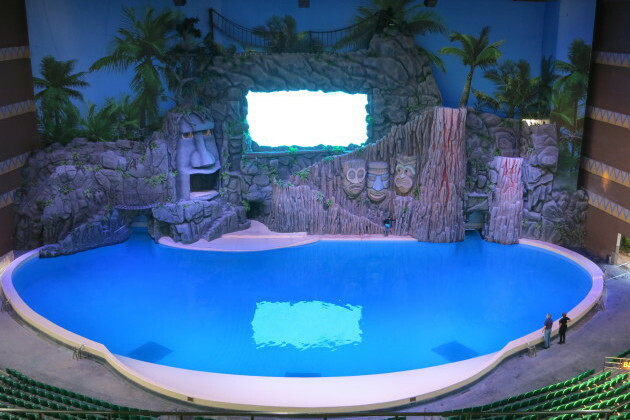 FUNA was able to establish fabrication and assembly of equipment racks, panels, and bracketry in China to western standards – and FUNA’s Ocean Kingdom work was its first, large scale theme park project to be fully fabricated in China. Design and engineering were executed in the US, and much of the equipment came from the US and Europe, but the final assembly, including nearly 70 racks, was accomplished in China, primarily by Chinese workers trained and supervised by experienced Westerners. This turned out to be both effective and efficient, and has become the model for our Chinese project execution. We gravitate toward projects that get us excited. And at a time when there are US-based projects available – plenty of stateside work to choose from – we have a strong desire to continue in Asia. Chimelong Ocean Kingdom was our first project in Mainland China. It was a good, healthy experience for us; we enjoyed it and we’re coming back for more. We’ll be jumping in with both feet over the next couple of years. The Chimelong Ocean Kingdom Finale Celebration (Lagoon) Show we worked on is a good example of what we found inspiring. They elected to create something original and over the top. It has mind-blowing image-mapping on the surface of an enormous Whale Shark Icon, 99 domed moving lights around the lagoon’s edge, more giant lighting effects from rigging around the Park, multiple lasers, elaborate fountains, fantastic flame, wondrous fireworks (that emit from a steaming volcano, behind the Icon from surrounding rooftops and even out of the Whale Shark’s mouth), PWC stunt drivers with pyro, kites with pyro, water cannons, flyboarders from out of nowhere… all set to a dynamic, original score…and that’s what they consider their ‘interim show’! 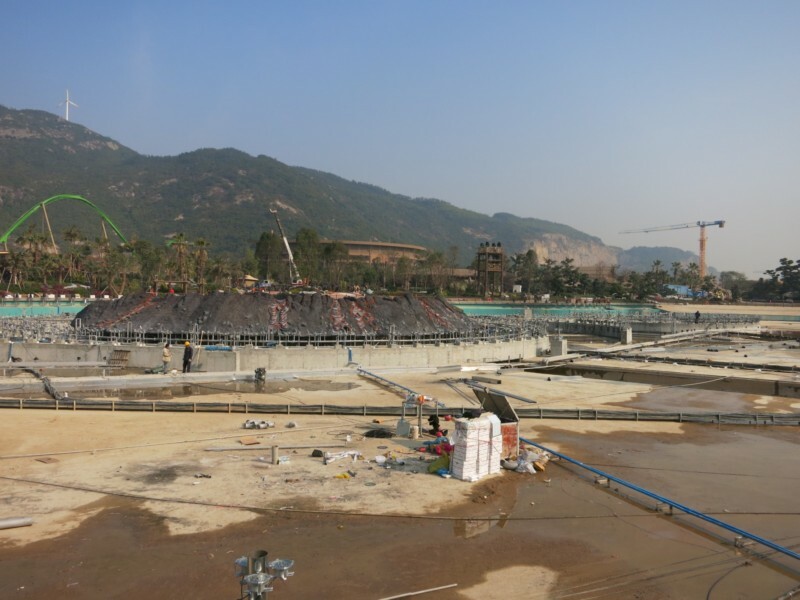 Chimelong was the first new-construction theme park project for FUNA in China and as such was very important for validating my assessment of the market potential there. We’ve been in China for years now and it has required a great deal of effort, resources and patience to play that long game. As a company, if you’re not planning to be there at least 10 years, then you shouldn’t even start. That strategy is not for the timid. Having patience and putting in the time and effort to develop lasting relationships is key, and we’re very grateful that Chimelong gave us a chance to earn their trust. TPG’s client list includes SeaWorld Parks & Entertainment, Disney, Universal, 20th Century Fox, among others. The company is currently working on a new dark ride in China, and projects in Malaysia, Korea and the US. As a Gold Level Sponsor of the IAAPA Attractions Expo in Orlando, TPG will be represented at the convention by co-CEOs Bob Chambers and Edward Marks, project manager Rob Palmer, and producer Chris Homsley. Says Marks, “The company currently has 22 fulltime employees. Our strength is in the ability to annex and add bandwidth to other companies – augmenting their staff, tech specialists, ride developers, producers, tech documentation. Depending what the client wants, we ‘ghost’ or do it in our own name. We have some fantastic partners now, including established design firms that had previously brought on their own freelancers, and new firms that decided to call on TPG rather than staff up. We will be announcing new, larger offices in Glendale soon – and after that,in Beijing. To set up a meeting at IAAPA with The Producers Group, contact Chris Homsley, chris.homsley@producers-group.com.